Waiting, Wondering, What Do I Do? 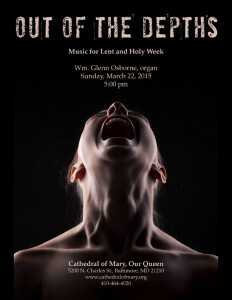 Another one of my duties at the Cathedral of Mary, Our Queen is to manage the concert series. It so happens that the artist scheduled for March cancelled (well before my arrival here), so I had to decide whether there would simply be no concert, or how I might choose to fill the slot. As our concert brochure announced a performance of Marcel Dupré’s Chemin de la Croix, I considered trying to find someone else who might play the piece, or if I might be courageous enough to improvise my own music for Stations of the Cross. While I opted to play mostly repertoire and fill the concert slot myself, the time I spend practicing repertoire is reminding me of things I need to do when practicing improvisation which I thought you might need to do as well. Perhaps it’s blatantly obvious, but in order to improve, we have to set aside time to practice. This includes our improvisations. Beginning in my student days, I set aside regular time to practice. My undergraduate teacher taught me to make my practice time sacred, something I haven’t necessarily done in recent years. Especially if practice time is hard to come by where you play, make practicing your number one priority when you have it scheduled. Don’t let any other appointments or phone calls interrupt you. When you decide to practice, make it a time of focused work with goals to accomplish. If you have regular practice time, it is easier to develop a plan for your improvisation practice so that not only are you not wondering when will you get to practice you won’t be wondering what to improvise today. If our goal when practicing is to improve the performance of the piece, then we pay attention to particular details of the piece and work them. If there is a technically demanding passage, we slow it down, play it in different rhythms, and then play it faster. If we want to include a difficult technical gesture in our improvisation, what might it look like? Think about it first and then play slowly. Just because something goes by quickly is not an excuse for sloppiness. Certain blocks of my practice time have been devoted to registering pieces for the concert. 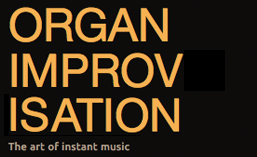 Perhaps a chunk of our improvisation time could be spent exploring new combinations at the organ. Choose odd combinations of stops that you might never have used before and search for a texture or style that works well with that sound combination. While we often look for sounds to express our ideas, what if we turn the tables and try to discover what ideas the sounds might suggest to us? Another great motivator can be a deadline. I certainly know that having a concert date on the calendar will get me on the organ bench a lot more than simply playing for Mass every weekend. While everyone often notices the bad effects of peer pressure, there can be good side effects as well. If you tell someone in advance when and what you will improvise, you now are responsible to that person and will be more likely to stick with your plan. While it can be intimidating to have another competent musician evaluate whether you do what you say you will do, there is a great deal of motivation and focus that you can gain by knowing someone is listening purposefully. Whether your goal is a simple four measure interlude (exactly four measures) or a whole concert of improvisations, choose a date and a time and tell someone your intentions. Waiting to find time on the bench or wondering what to do when we get there doesn’t help us improve. Whether we are learning a new piece, polishing repertoire for a concert, or practicing our improvisations, having a purpose and a deadline for our practice time will keep us on the road to being better organists. May you find more time for focused practice! Posted in Newsletter. Tagged Goals, Newsletter, Practice.